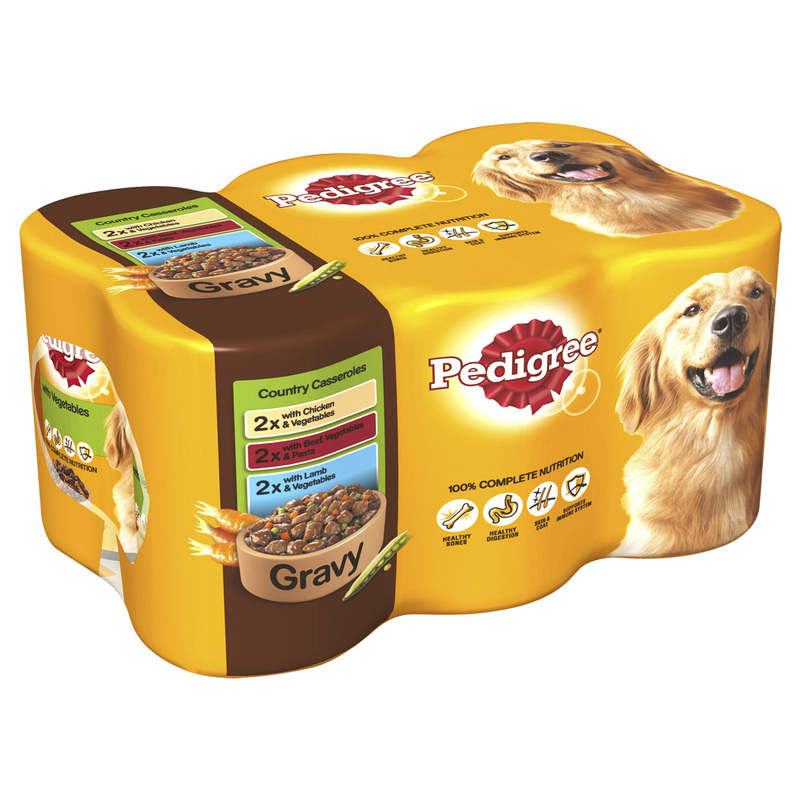 Pedigree Adult Country Casseroles in Gravy are the best ever recipe that contains a special formulation that delivers superior nutrition through ingredients that bring four main benefits for your dog. The tasty meal contains a special blend of linoleic acid and vitamin E for a healthy skin and luxurious coat, natural wheat and sugar beet pulp fibres to support good gut health, vitamins and minerals to support their natural defences and a specially designed texture to help clean your dogs teeth as they chew. Meat and animal derivatives (33%, including 4% chicken), cereals, vegetables (4% mix of peas and carrots), derivatives of vegetable origin (0.8% dried sugar beet pulp), minerals, oils and fats (0.4% sunflower oil), vegetable protein extracts. Meat and animal derivatives (33%, including 4% beef), cereals, bakery products (4% cooked pasta), vegetables (4% mix of peas and carrots), derivatives of vegetable origin (0.8% dried sugar beet pulp), minerals, oils and fats (0.4% sunflower oil), vegetable protein extracts. Meat and animal derivatives (33%, including 4% lamb), vegetables (4% mix of peas and carrots), cereals, derivatives of vegetable origin (0.8% dried sugar beet pulp), minerals, oils and fats (0.4% sunflower oil), vegetable protein extracts. There are currently no questions for Pedigree Adult Country Casseroles in Gravy Dog Food - be the first to ask one!